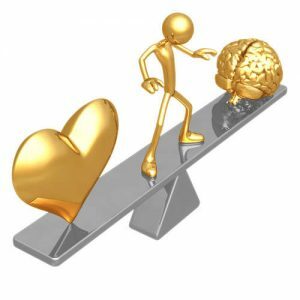 Heart Beats Brain - Is Accurate Forecasting of Specific Results in Football Matches Possible? Of the four leading teams in the English Premier League before this round of matches only Manchester City won last weekend. My husband just cannot understand how Manchester United, who hadn’t lost a single league game since the beginning of the season (as long ago as August 2010), could suddenly serve up such an insipid performance and lose to bottom of the table Wolves? Likewise, how Arsenal with a seemingly impregnable 0-4 lead at half time, could self-destruct so badly and concede four second-half goals to mid-table Newcastle? Or how Chelsea, who normally never lose at home, could succumb to Liverpool who have struggled to win away this season? The ‘football fan’ in my life is now proffering various excuses for these unexpected results: one of Manchester United’s most important defenders injured himself in the warm-up and had to be replaced minutes before kick-off, which unsettled the formation of the team; Arsenal were rattled at the start of the second-half when they had a man sent off, which subsequently weakened their midfield and altered their formation drastically; Liverpool’s former star striker transferred to Chelsea only a week prior to the game and immediately stated he was fated to score against his previous employers, of course providing them with a big incentive to stuff those words back down his throat. My husband’s heartfelt opinion prior to these matches was that they were ‘nailed on’ victories for the three favourites. A ‘sure win’ possibility would mean to me odds of around 1.1 (90%) up to a maximum of 1.2 (83%). However, looking at the odds for the three games in question Manchester United were 1.4 (71%), Arsenal 1.67 (60%), and Chelsea 1.62 (62%). Putting this into perspective, Manchester United, despite not losing a single league game for almost six months, had only a 71% chance of victory against the league’s weakest team, Arsenal had a 40% chance of not beating a perceived weaker team in Newcastle, and Chelsea, who have made Stamford Bridge a fortress in recent years, had as high as a 38% chance of not beating Liverpool. None of these odds reflected ‘sure win’ prospects to me and the final results showed that the bookmakers’ calculations were quite correct. How were the bookmakers able to forecast such an ‘unusual’ weekend with such accuracy and indeed, did they actually forecast it? There are so many variables which play a role (including the manipulation of fixtures) that forecasting a specific result with 100% accuracy is simply impossible. There are simply no ‘sure win’ or ‘secure’ betting events! If a dice is thrown it is not possible to forecast with accuracy whether a 1, 2, 3, 4, 5 or 6 will occur in the next round. However, everybody will agree that it is possible to forecast that if the dice is rolled 1,000 times the distribution should give relatively equal numbers of 1, 2, 3, 4, 5 or 6. 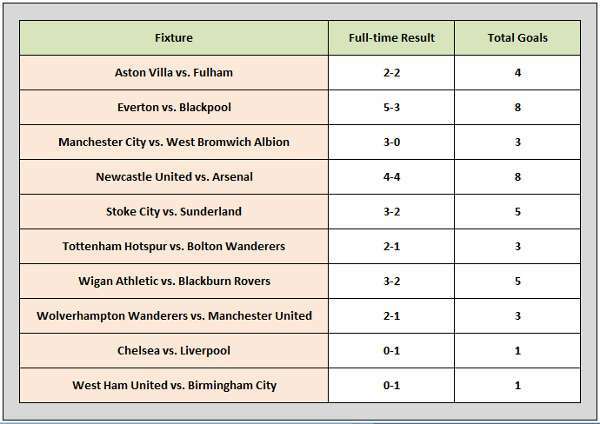 Can football results be compared with dice rolls? In my opinion, football results are subject to exactly the same statistical rules as the dice. This means the individual scores are distributed randomly but in the end there is a certain percentage of each score. Last weekend clearly showed that forecasting a Manchester United, Arsenal or Chelsea victory with any certainty is impossible but it is possible to forecast that United, Arsenal or Chelsea, due to their historical records, will probably win X% of all games in a season. It is also possible to forecast that Y% of all games will finish with a certain number of goals. 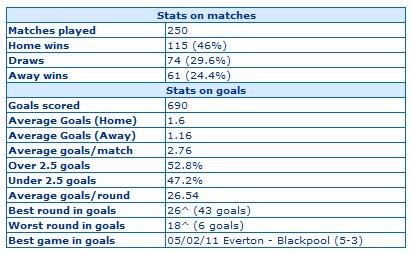 During the 2010-2011 season there have so far been an average of 2.76 goals per match and of these games, 52.8% finished with over 2.5 goals. Last weekend therefore saw a strong deviation with an average of 4.3 goals per match and 80% finishing with over 2.5 goals. Even for non-statistically minded people the enormous number of goals was remarkable and without having a rational reason to explain it, perhaps the heart conquers reason with miscellaneous injury, suspension and other conspiracy theories. 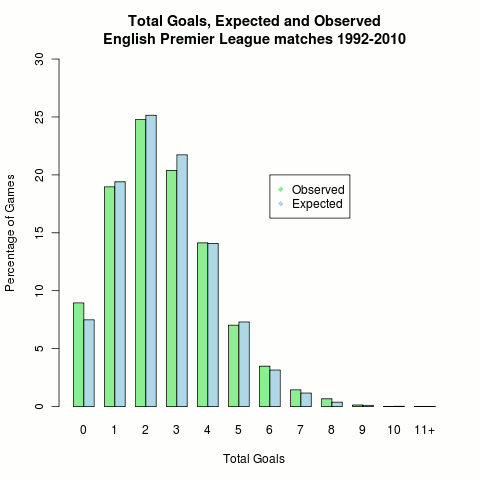 This graph illustrates the distribution of goals in the English Premier League for 18 seasons from 1992 to 2010 (i.e. goal distribution based on past performance). As you can see, the observed number of goals (green bars) and the expected distribution based on 18 seasons of statistics (blue bars) are nearly equal. 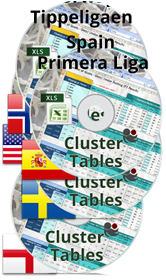 Last weekend’s cluster happens statistically only once every 760 rounds of matches, or once every 20 years! Even last weekend’s enormous variance is still subject to ‘statistical regularity’ and therefore the bookmakers’ odds reflected this correctly with none of the favourite teams having a larger than 70% chance of winning their respective games. I believe that punters have to resign themselves to the fact that in the long-run football game results can be explained and described with mathematics and statistics. If you have historical distribution data to hand and have learned how to convert these into odds then it is possible to forecast the results of games, perhaps not individual ones but the statistically expected distribution on a long-term basis. With this knowledge odds can be calculated. For a bookmaker, there is no other way of setting odds and punters should follow suit to compete on an equal footing. Only with mathematical and rational approaches can you expect to make any money with betting. Forget current form, who the manager is, perceived strong or weak teams, injuries, suspensions, recent transfers, the weather conditions and your personal emotions towards any team. All of these factors combined play only a small role in the actual outcome of an individual event. The English Premier League proved this once again last weekend. Understand how odds are calculated and master this process, and then if you haven’t given up in the meantime, bet on statistically expected results with strictly calculated profitable odds. This may sound boring and much too mathematical and technical but I assure you it is the only way to make money with gambling. Once you have achieved this level of competency you cannot call it gambling any more; it will then be more akin to investing and trading than gambling. What Does ‘Form’ Mean in Football? Thanks for the update. Browser compatibility is a challenge, and we are constantly working on it. Mobile compatibility is even more of a task.